The National Geographic Channel and Canon Singapore EOS Young Photographer Award 2013 contest was recently concluded with great success and they received more than 27,000 entries from around Asia with 3,565 Singaporeans among those vying for the grand prize: An all-expenses paid National Geographic Photography Workshop in the US, plus a Canon EOS 60D DSLR camera with EF-S18-55mm f3.5-5.6 IS II Lens. Themed “A Celebration of Colour”, the EOS Young Photographer Award 2013 was open to aspiring photographers aged 13 to 25, and jointly organised by National Geographic Channel and Canon Singapore Pte Ltd. This was something that I supported and shared in a post with my friends and readers earlier in the year, attended Joe Riis Photography Seminar, who was in Singapore to share about the EOS Young Photographer Awards and impart his knowledge and wisdom in photography. The photography seminar by Joe Riis was a highlight with many students at the auditorium listening attentively to his sharing and I learned too as well from attending the photography seminar! Looking through the EOS Young Photographer Award 2013 winning entries, they were pretty impressive and of high standards! 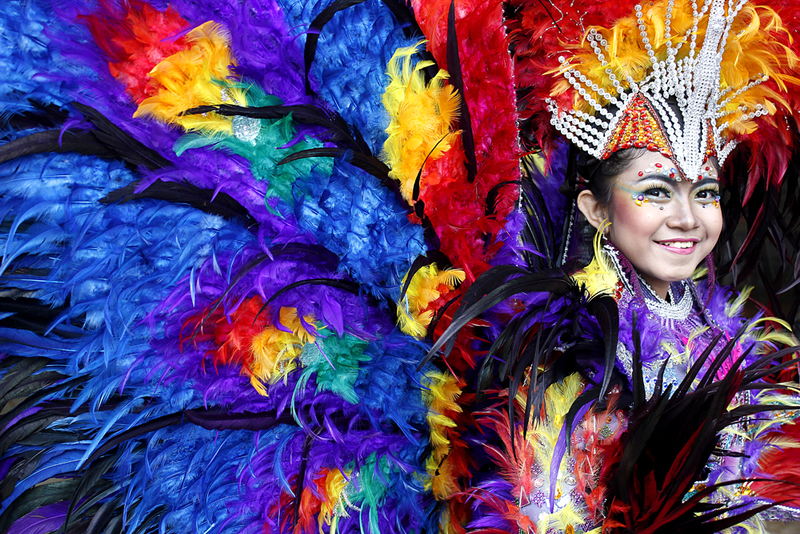 From all the entries submitted, Hanggi Tyo, 21, from Indonesia emerged as the champion, walking away with the coveted first prize, with her entry, “My Full Colourful Smile”, a photograph taken at the Jember Fashion Carnival Show in Jakarta in December last year. Tyo’s shot, which depicts a smiling young woman clad in a vibrantly colourful costume, garnered much praise from the judging panel, which included National Geographic photographer, Gabby Salazar. First runner up was Malaysian Chan Zhi Ying, 22, who walked away with a Canon EOS 650D with EF-S18-55mm f3.5-5.6 IS II Lens for her submission entitled “Happy in Red”. The photograph depicts a child splashing in a tub of water while having her bath, conveying a feeling of unbridled happiness and carefree delight. Twenty-one-year-old Geovani Orlando from Indonesia also impressed the judges with his photo submission, “Paju Jawi From Ranah Minang”, earning him the title of second runner up and a Canon EOS 1100D with EF-S18-55mm f3.5-5.6 IS II Lens. In addition to the three main prizes, the contest also awarded bi-weekly winners for the colour themed Voter’s Choice Award, held between April 9 to June 3, with an 8GB EOS Memory Drive and National Geographic Channel X Morn Creations Limited Version Shark Backpack each. Meanwhile, the Grand Voter’s Choice, which was tracked from the beginning of the campaign, was awarded to Saidkhsan from Indonesia. He took home an EOS Camera Bag and National Geographic Photo Book for his submission entitled “Love Story”, depicting two entwined butterflies on a vine. Other noteworthy entries highlighted by the judges were “Panorama de Shah Mosque” by Shaharyar Hyder, “The Longest Sock” by Firman Maulana, and “Three Yellow Guards” by Danniel Partogi. Following the overwhelming response and success of this inaugural event, both organisers are now looking forward to kicking-off another photo contest in October 2013. More details will be released nearer the launch date. Do vist and drop EOS Young Photographer website here and check out the photographs!